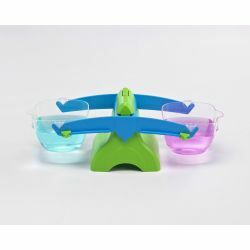 These durable plastic balances are designed to allow students to compare liquid and solid mass. Both versions offer clear, graduate easy to grip and pour buckets … even for small hands. Easy to clean! The sliding compensator offers 1 g sensitivity for accurate measurements. 500ml 40Lx11Wx15cm H; 1L 47L x 13W x 17cmH.